To say the least Glenn Kulka has had a controversial and colorful career. A mouthy player who never had a problem speaking his mind, Kulka was quite an athlete, not only playing gridiron football but also in hockey and professional wrestling. Nicknamed, “the Kulkster”, Kulka has amazing upper body strength and constitution, once bench pressing an amazing 225 pounds a record 53 repetitions. 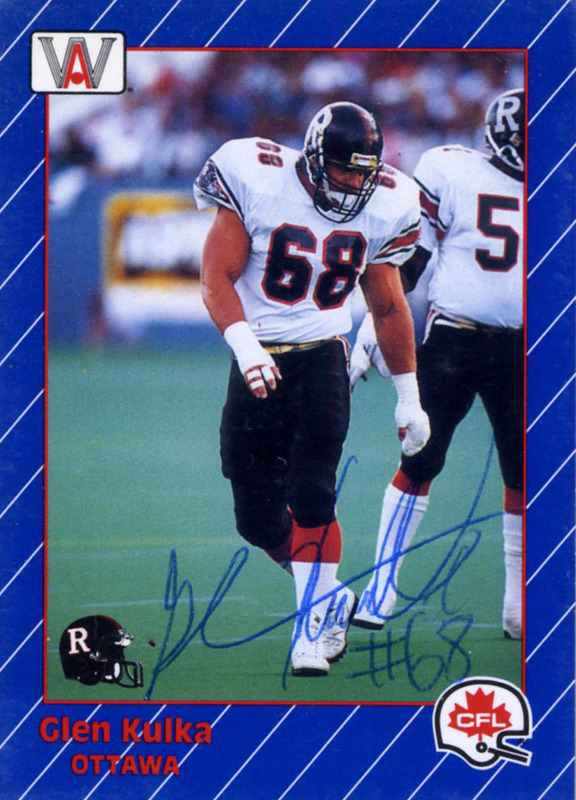 Glenn initially played minor league hockey, and based on his amazing athleticism was signed as an offensive lineman by the Edmonton Eskimos in 1986. Glenn wouldn’t really find his position of calling in football till he signed with the Ottawa Rough Riders who converted him from a linebacker to a defensive end. In 1991 he was named a CFL All Star. Unfortunately in 1992 Kulka was busted for cocaine possession but he turned this into a positive by serving as the league’s spokesperson against drug use. After a meeting with Bret “The Hitman” Hart in 1995, Glenn would decide to pursue a career in pro wrestling and started transitioning out of gridiron football. He’d continue wrestling working his way up the minors reaching the apex of his career wrestling from the WWE in 1999. He’d go on to wrestle in a variety of leagues after leaving the WWE, and retired briefly from the sport in 2000. Later Kulka admitted to rampant steroid abuse that he started when he was with the Rough Riders and throughout his career in wrestling. In retrospect Kulka has felt that he has lived a blessed life. Glenn since retirement has enjoyed a variety of interests and business pursuits including car dealership and gym ownership, CFL commentary, some more wrestling, and as a theater performer. As the master sportsman Kulka hasn’t finished his life in sports and has started pursuing a career in MMA. He also speaks out regularly against drug and steroid usage. This card was part of the blitz of CFL players that I received when I mailed out to the CFL after they announced expansion plans. It is an error card as Glenn’s name reads as ‘Glen’ on the card.